Rock Steady Boxer Pete Stewart shared these inspirational words at the 5th Annual RSB Fundraising Breakfast on October 15, 2015. Thank you, Pete, for fighting back. How it all started. My journey began around 10 or 11 years ago when I noticed a mild occasional tremor in my left hand. When I finally went to a doctor at the urging of my beloved wife, I fully expected to be reassured that it was nothing serious and that there would be pills available to make it all go away. There was no such pill. The doctor bluntly told me that I had Parkinson’s disease, a chronic degenerative neurological disorder for which there is no cure and which gradually destroys the ability of the brain to send nerve impulses to the muscles of the body. The prescriptions available would only give limited and temporary relief of symptoms. How I happened upon Rock Steady. I moped along for the next four or five years until I noticed an article in the newspaper which said that the physical therapy department of the University of Indianapolis was conducting a comparative study of the effects of various exercise programs, including the Rock Steady boxing program, on the progression of Parkinson’s disease. They were looking for Parkinson’s patients to volunteer to participate in the program. No charge. This intrigued me so I volunteered. What was there to lose? When I arrived at the University of Indianapolis campus, I was asked to draw a straw for the program I was to participate in. This way the test results would be as objective as possible. As you might surmise, I drew the Rock Steady Boxing straw. When I arrived for the first day of my practice at the gym, I noticed this big heavily muscled guy furiously beating the air out of a speed bag. This person was Tom Timberlake. 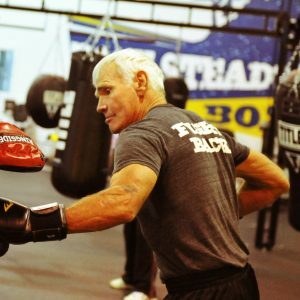 I saw another person, older, smaller in frame and gray-haired, throwing rib cracking hooks and upper cuts on a heavy bag with the same fury. This was mild-mannered Judge Lou Rosenberg. Not by accident. There are those who say that life came into existence by random collisions of molecules over billions of years without plan or purpose. They would also say that it was by blind luck and sheer accident that I drew the Rock Steady straw. They are wrong on both counts. I see the hand of God in all of this. The Bible says that all things work together for the good for those who love God and are called according to His purpose. I believe this scripture has been fulfilled for me. With Rock Steady, I am where I need to be and where God planned for me to be – with a bunch of crazy people I am proud to call my friends who have uplifted me and inspired me to do the most I can with what I still have. The benefits and blessings received. The superiority of the physical benefits of the Rock Steady program over other exercise programs in the slowing down of the progression of the disease have been documented by the University of Indianapolis study. This is important, but for me it is the spiritual benefits which count the most. Steel is hardened and gold is refined by fire. Greatness of character can be forged in the furnace of affliction. There is something about sharing the same foxhole with others in a battle against a terrible but determined enemy that unites us even though we are from different backgrounds and makes us stronger as individuals. We are indeed a band of brother and sister warriors united in a fight against Parkinson’s, a fierce and deadly enemy. In this fight we will not be passive. We are pressing the attack and taking the offensive. We will not relent. We will never surrender. We will never give up until our last breath is drawn or the enemy is vanquished. Our hope. We fight with hope. The Bible also says that even in our sufferings we can rejoice. For suffering produces perseverance. Perseverance produces character and character produces hope which does not disappoint. Our hope is that at least for some, the Rock Steady program will slow down the progression of the disease until a cure is found. But if, because of my age and advancement of the disease, I go down for the 10 count before a cure is found, that is okay. For I will have gone down swinging with the quiet satisfaction of knowing that I lived nobly, fought valiantly and died courageously.